Since 2000, European Monitoring Centre for Racism and Xenophobia (EUMC) developed a European Racism and Xenophobia Information Network (RAXEN) composed of National Focal Points (NFP) in each Member State. 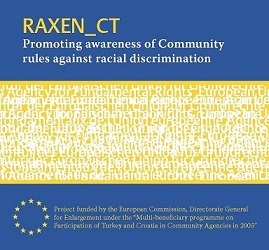 In 2006, EUMC started the RAXEN_CT project in cooperation with DG Enlargement in the framework of the "Multi-beneficiary Programme on Participation of Turkey and Croatia in Certain Community Agencies in 2005". With this project, NFPs have been selected in candidate countries on the basis of a comprehensive European tendering process. As of June 2006, Istanbul Bilgi University Human Rights Law Research Center has been selected as the NFP for EUMC (current European Union Agency for Fundamental Rights-FRA) in Turkey. At the national level the RAXEN NFPs are EUMC's main source of data and information on the situation concerning racism, xenophobia, anti-Semitism and related intolerances. NFPs' deliverables constitute at the national level the essential background material for the development of comparative reports and studies by the EUMC at the European level. As the NFP for Turkey, Istanbul Bilgi University Human Rights Law Research Center has set up a national information network, which includes cooperation with main actors in the fields of racism, xenophobia and anti-Semitism, being either governmental institutions, NGOs, research bodies, specialised bodies or social partners. In this way the Center is considered to be the national coordinator for reporting to the EUMC. The Center is also required to coordinate and structure the national data collection and transmit the information to the EUMC according to specific guidelines.